im having trouble with this , i downloaded & installed the program , however when i go to mount , it does not give me the option to do so . there is a manual file for a shortcut and an uninstall file . when i right click virtualclonedrive , explore open search scan with ad aware , these are the things listed . what am i doing wrong? i've rebooted the vista home premium edition machine and tried it just sits there. this is an amd turion processor..not sure if that has anything to do with it or not. any help you can give is appreciated. Were going to get this going for you I promise! Is this where your right clicking on the Icon? Or are you right clicking on the icon in the Toolbar (bottom right of screen next to clock? Do you have that icon? in vista i don't see the clone drive in explorer however the vc icon is on the desktop. it's almost as if the application is not installing even though it says it is. Have you tried to uninstall and reinstall? 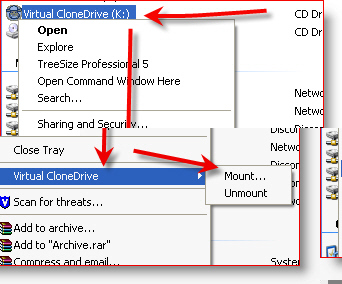 Once installed, you should have the CloneDrive Icon in Windows Explorer and if you right click it, you should have the options to Mount an ISO or CD Image. Are you running Windows Vista 64bit or 32bit? Remember, clonedrive does not work on x64. this is vista 32bit & yes i have tried rebooting, turning the system off and waiting 2 or 3 hours for no reason etc.. i have also tried installing and uninstalling. this is a brand new machince right out of the box not a rebuild or an machine that has had mulitple things installed or uninstalled etc. this is vista 32bit & yes i have tried rebooting, turning the system off and waiting 2 or 3 hours for no reason etc.. i have also tried installing and uninstalling. this is a brand new machine right out of the box not a rebuild or an machine that has had multiple things installed or uninstalled etc. Ok. Clean machines are nice. After you reboot and see the icon on the desktop, Double Click on it. Were you able to get this far? You should just goto MagicISO. 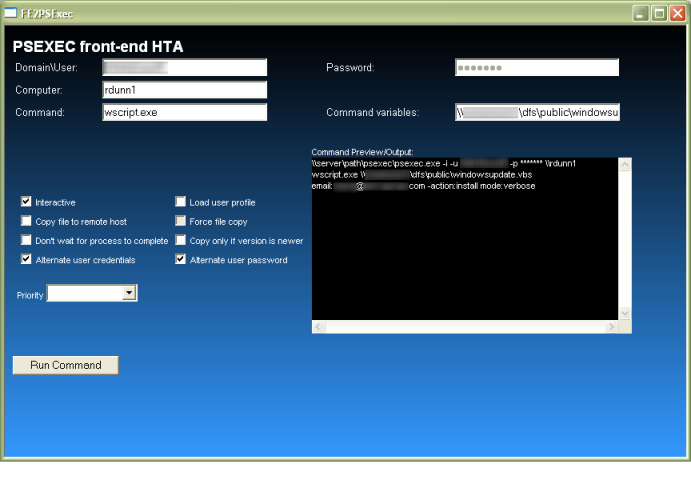 It's free, easy to use and compatible with XP, Vista, Server 2008 and unlike Virtual Clone drive, it support x64. 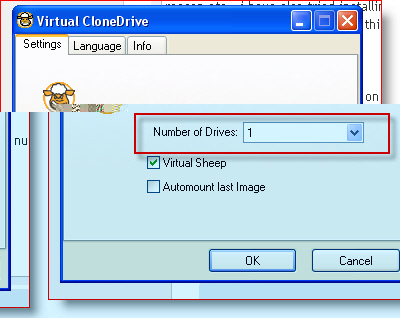 Virtual Clone Drive is x86 or 32bit only. Try that out and post back if your fixed! mounted the iso and when i click on it it says "windows cannot access this disc"
Hi Mackenzie! Welcome to the site! Most likely the problem is not with your install or what your doing but rather, the problem is the ISO. Do you have another ISO you can mount and test out? Let me know. I can create a small ISO if needed and post it somewhere you can grab it. Sounds like you have a bad ISO file. You should also go download MAGIC ISO (that's what I use) and see if you have the same problem. BTW - you can grab an ISO file anywhere these days. try a few of them to make sure it's not a dud like groovy dude said. I like to use Daemon tools Lite. Haven't tried virtual clone drive or magic ISO. But yeah it sounds like you have a corrupted ISO file or in some cases a file won't be readable by certain virtual drive software if it was made by another software brand, such is the case with Alcohol %120 formatted discs. Let me know if that helps out. As I wrote, I already uninstalled the deamon tools and tried magic ISO, alcohol 120% and now virtual CloneDrive. With all of them I get the same problem, in which I can't see the virtual drive in My Computer as I could before the problem. The SCSI/RAID Host Controller only appears when I ask for a virtual drive, so I guess that's what the system finds when I enable the virtual drive. One fix i found was, open up the command prompt and enter these commands. Reboot the computer and reinstall, see if it works. Make sure you are really running 32 bit vista, this is known to happen to 64 bit users quite often. It didn't work, but thanks for trying. And I do have windows 32-bit version. Good option. I've never seen this issue before. Sorry.. When all else fails I always stick to the ultimate solution fix for every problem in XP/Vista. I absolutely agree about DT Lite! It has a very friendly UI and it's easy to use!